Summer vacations at the beach provide a great opportunity to collect seashells. Then, once back home, you can make beautiful crafts with them. 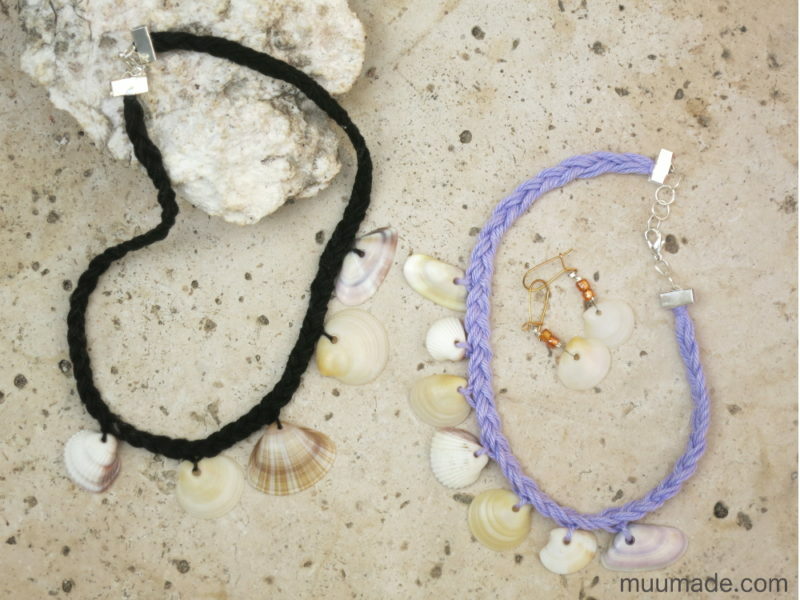 This year, we made seashell choker necklaces and earrings from the treasures we found while on vacation. If you did not find shells with holes, you can make small holes in them using a drill or a pair of sharp scissors. 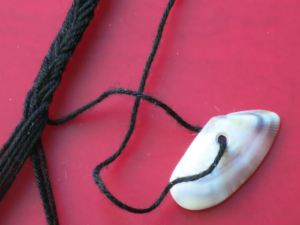 Or, you make a shell pendant by wrapping decorative wire around the shell to create a small loop. 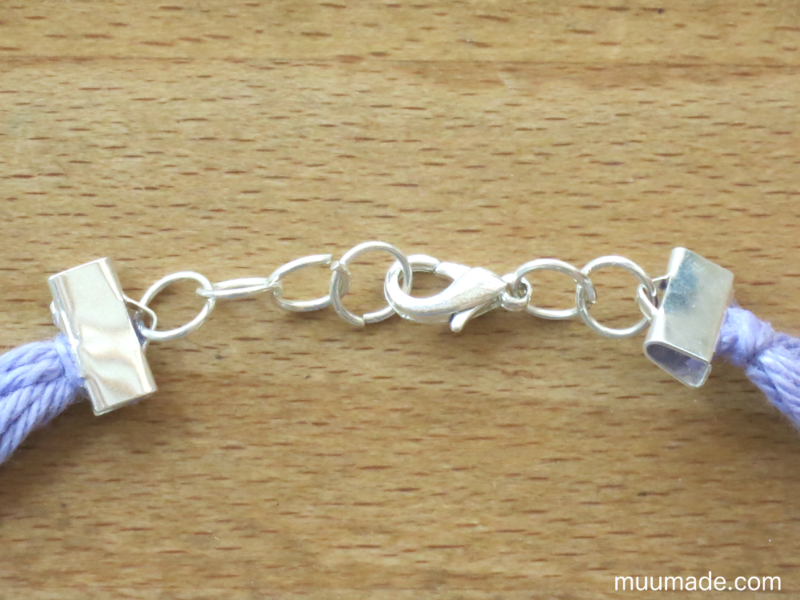 The chokers that we made are about 6 mm (1/4″) wide. The number of strands of crochet thread needed depends on the size of your thread. The sizing of crochet thread works as follows: The larger the number, the thinner the thread. So, Size 10 that I used (in black) is thinner than Size 3 that my daughter used (in lilac). So, I used 12 strands of Size 10 crochet thread while my daughter used 9 strands of Size 3. In both cases we made each strand about 50 cm (20″) long. 1. First, make a kumihimo finishing knot in one end of the bunch of crochet thread. Do not trim off the loose ends just yet. 2. Then, start to braid! 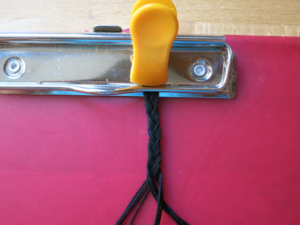 We used a clip board and clips to help us keep the thread taut while braiding. If you are using 12 strands of thread, each strand of the braid will have 4 strands of thread. If you are using 9 strands of thread, then each strand of braid should have 3 strands of thread. 3. 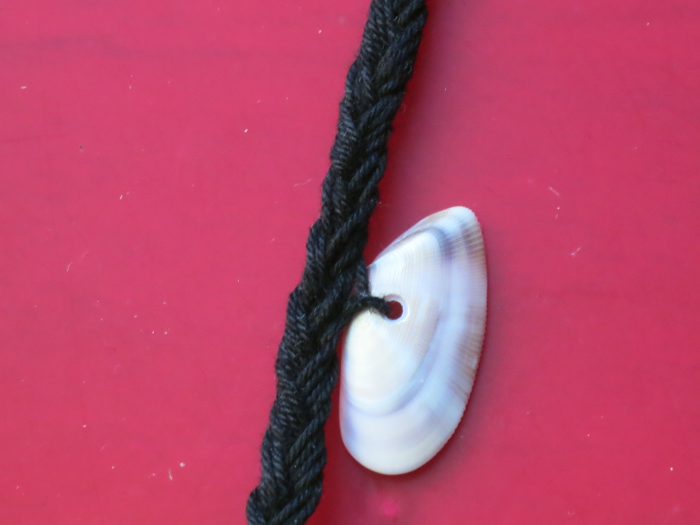 After braiding about 12 cm (5″)*, add a seashell. To do so, first pull to one side 2 of the 3 strands of the braid. From the third strand, separate the thread that is on the outer edge of the braid. 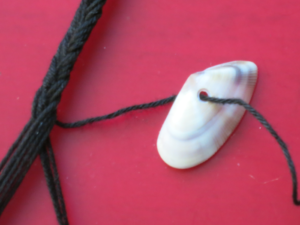 Thread that strand through the hole of your seashell, inserting it from the reverse side of the shell and pulling it out from its front side. *If you are making a choker for a child, you may want to stop braiding at about 10 cm (4″), depending on how small her/his neck is. 4. While keeping the shell a few centimeters (approx. 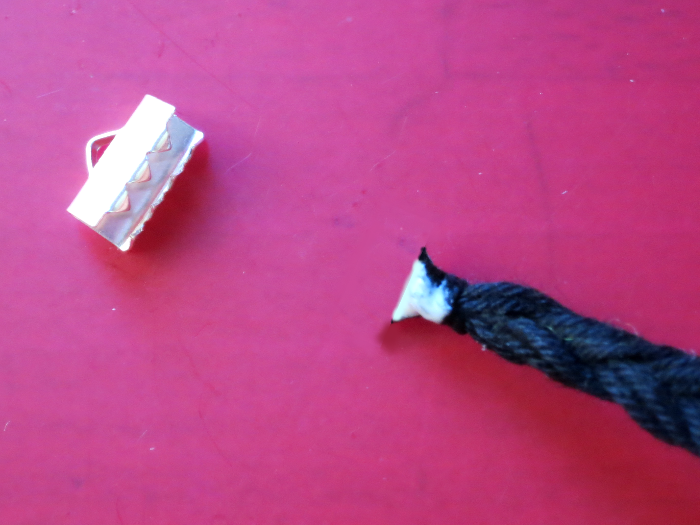 1″) away from the braid, bring the end of the thread around and pass it under itself between the braid and the shell. Pull the thread until you have a small loop (about 2.5 cm (1″) in diameter) next to the shell. 6. 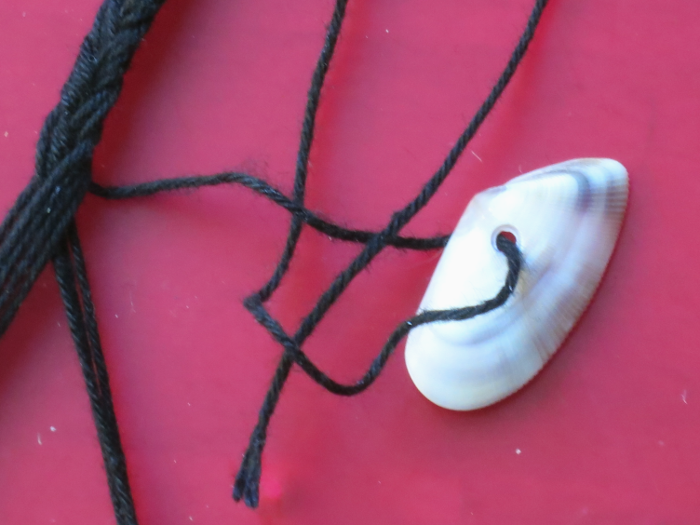 Carefully pull the thread, while gradually pushing the shell toward the braid. 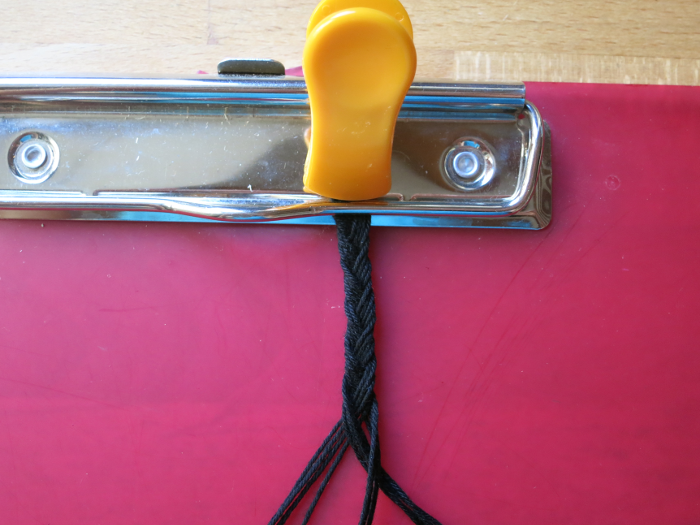 Pull the thread taut until the shell is snugly attached to the outer edge of the braid. Now, start braiding again. 7. Braid 2.5 cm (1″)**, then repeat Steps 3 through 6 to attach a second seashell. 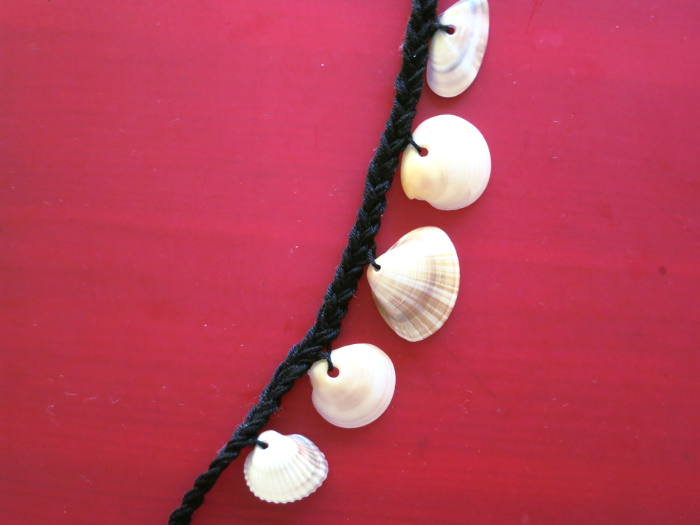 Continue to braid and insert shells until you have attached all 5 shells to the braid. 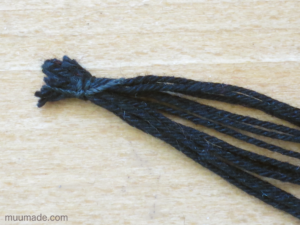 Then, braid 12 cm (5″) more (or 10 cm (4″) more for a child’s choker). 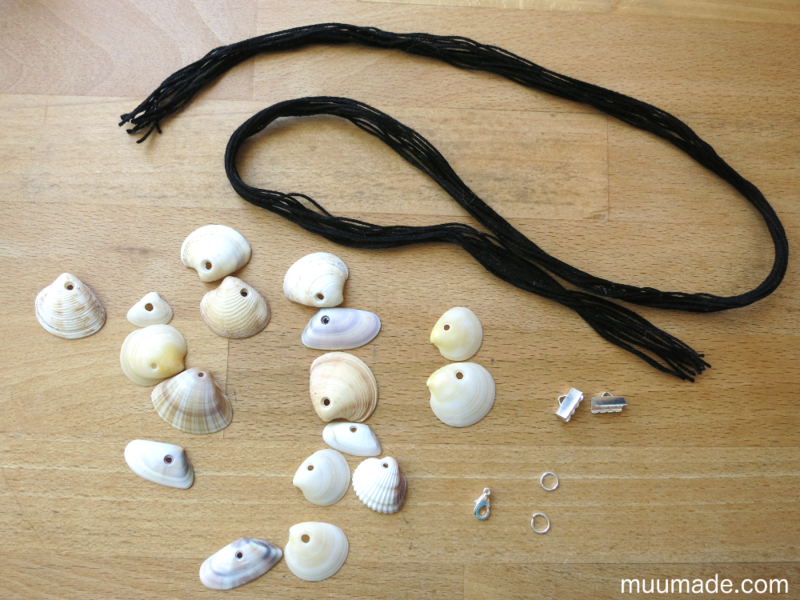 **If you are attaching 7 small shells, braid 1.5 cm (5/8″) instead before attaching an additional shell. 8. When finished braiding, make the same kumihimo finishing knot as in Step 1 at the end of the braid. Trim off the loose ends very close to the knot. Apply a bit of craft glue to the trimmed end of the braid. 9. 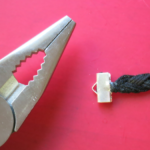 Using a pair of pliers, attach a crimp to the glued end of the braid. Repeat Steps 8 and 9 with the other end of the braid. 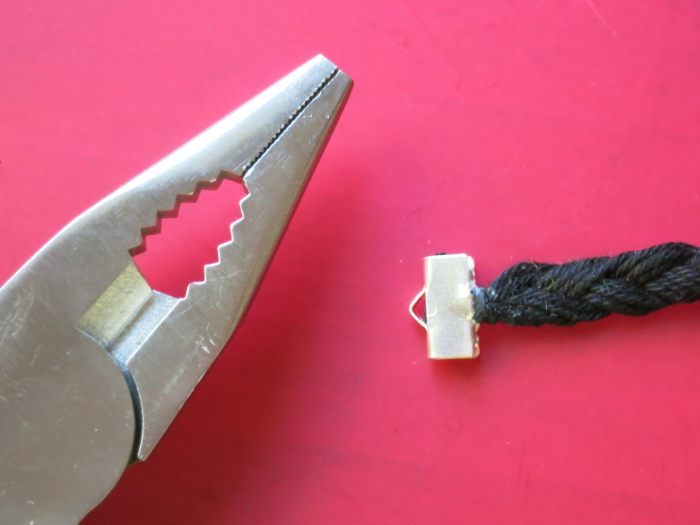 Attach a jump ring and a clasp to one of the crimps. On the other crimp, you can attach one or more jump rings. If the choker is a bit smaller than you wanted, attaching multiple jump rings is a good way to solve the problem. When connected together, these jump rings become an adjustable necklace chain! Now are you ready to adorn yourself with a wonderful reminder of your trip to the beach! 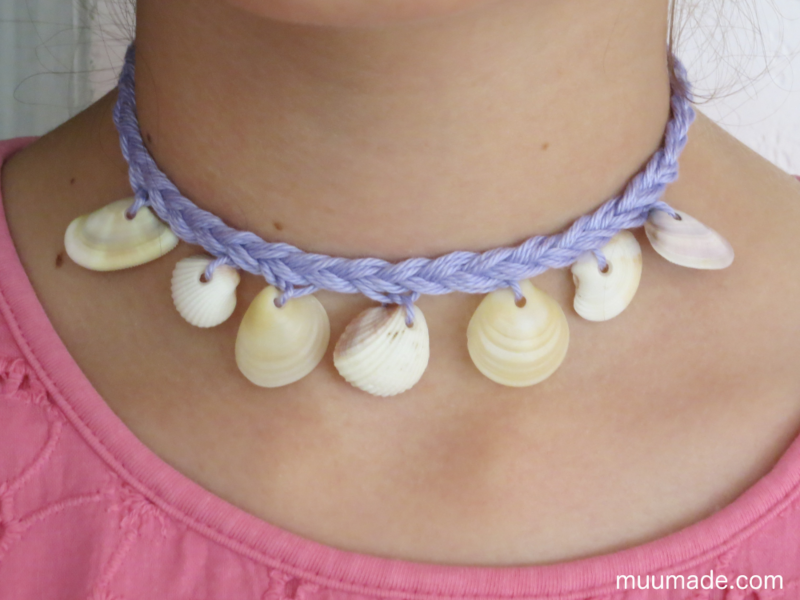 And if you still have shells left after making seashell choker necklaces and earrings, here are more craft ideas with seashells.